It’s something that’s easily neglected, especially during the cooler months, but keeping your mower blades sharp will have a huge impact on your lawn. Dull and worn out blades will rip and pull your grass, leaving frayed and damaged lawn. 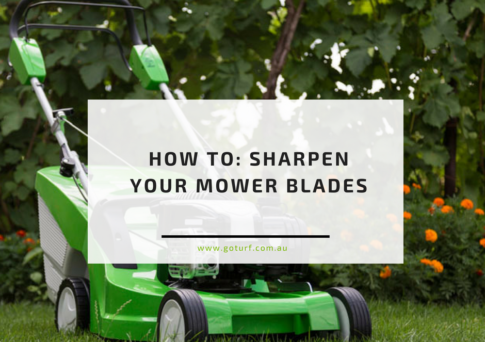 We have spoken before about how to maintain your mower, but we thought we would delve deeper and highlight the importance of keeping your mowers blades sharp and ready. Using the few simple steps we have included below, you can have your mowers blades in top condition and a cleaner cut (mowing stripes, anyone?) and better quality lawn all year round. First and Foremost: Make sure that before you begin working on your mower you remove the spark plug! Any motor rotation during the operation could start the engine, which can be very dangerous for you and anyone around you. To start with you will need to loosen and remove the bolt that holds the blade in place. If your mower is older or a little rusty, you may need to apply some lubricant and wait a few minutes until it’s loose enough to remove. Before you remove the blade, it pays to mark it somehow (spray paint or a marker will suffice) so that you know the correct way to reinstall it. If it’s not put back on the correct way, it won’t cut! Once you have removed the blade from the mower, it’s time to check for any rust or excessive wear. See if you need to sharpen the blade or even replace it. Any minor rust on the blade can be remedied using steel wool and a little elbow grease. It pays to have a spare mower blade in your garage or shed so that you can alternate between the two or just have a replacement on hand if necessary. While angle grinders are much faster at sharpening mower blades, they allow you must less control and carry the risk of damaging the blade by overheating it. We think one of the best ways to sharpen your mower blades is by hand with a hand file, which gives you must more control over your work. As always when working with any sharp objects, take the utmost care and use protective clothing if possible. After sharpening your blades, you’ll need to make sure that both sides of the blades are balanced. This can be done by tacking a nail to the wall and handing the blade from its centre point. If the blade is dipping to one side, you’ll need to file more off that edge on the non-cutting side. Repeat this process until the blade sits equally balanced. Using the mark you made earlier, put the blade back into your mower and fasten the bolt into place. You need to make sure the bolt is firmly tightened as a loose blade will affect the engines timing and therefore the mowers ability to start when it comes time to mow your lawn. Your mower blade should be checked every 6 months or so to make sure it’s in good working (and mowing) order. If not, your grass will pay the price! If you are ready to take your lawn to the next level, call Go Turf, the largest turf supplier on the Sunshine Coast and your local turf experts.